Buried deep inside Hans Christian Andersen’s fairy tale The Little Mermaid are traces of universal gay themes: an acute self-consciousness about being different, the longing to escape to another world, the belief that you have to leave home to find love and selfhood, the sacrifices it takes to straddle two different existences. You could probably find a way to identify with the way these themes play out in the new Broadway version of The Little Mermaid (based on the 1994 animated movie musical). But you’d have to work pretty hard. Mostly the show offers the two things you can expect from any Disney production on Broadway: some of the best visual design in the business, and a tried-and-true crowd-pleasing family-friendly story complete with stock characters, predictable situations, conventional comedy, and a guaranteed happy ending. 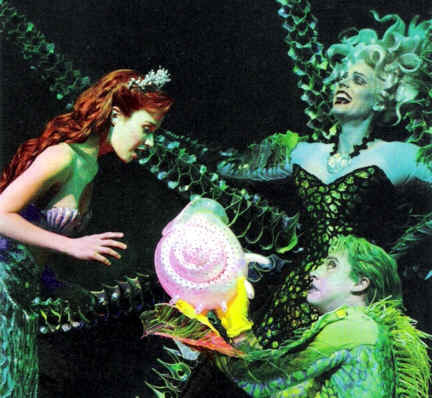 Mermaid surfs into Broadway in the wake of two long-running stage versions of hit feature-length Disney cartoons (The Lion King and Beauty and the Beast) and one that flopped (Tarzan). For grown-ups who’ve seen more than one of these, the formula has gotten pretty stale. But the Disney franchise thrives on the assumption that every year there’s a new wave of seven- year-olds who don’t know the story yet, and repetition isn’t necessarily a bad thing. I couldn’t help tracking how slavishly The Little Mermaid follows the narrative structure of The Lion King. Spunky child (in this case, Ariel, played by lovely Sierra Boggess) can’t resist the temptation to explore territory forbidden by stern but kindly father (the supernaturally buff and very talented Norm Lewis as King Triton), develops the obligatory love interest (Prince Eric, played by generic male ingénue Sean Palmer), runs into danger embodied by a villainous relative (that would be Ursula the Sea Witch, in the form of Sherie Rene Scott) with two weaselly sidekicks, gets rescued by comic-relief characters of different species, all to the tune of vaguely Afro-Caribbean-flavored Hollywood pop songs. Did I miss anything? There’s plenty of queer energy on The Little Mermaid’s creative team. The production was instigated by Francesca Zambello, the acclaimed lesbian opera director who is famously partnered with Pulitzer Prize-winning cultural critic Manuela Hoelterhoff. The book was written by gay playwright Doug Wright, the Tony Award-winning author of I Am My Own Wife, who also adapted Grey Gardens for the musical stage. And of course the songs for the original Disney movie were co-written by gay lyricist Howard Ashman (whose lover accepted his posthumous Academy Award for Beauty and the Beast). Alas, they don’t manage to make the show terribly palatable to anyone who’s not a pubescent female. In contrast to Xanadu, there’s nothing tongue-in-cheek about The Little Mermaid. It’s still a pretty-white-girl meets pretty-white-boy, girl- loses-voice, girl-gets-boy story. To my mind, the stars of the show (which was also true of The Lion King on Broadway) are the designers. Tatiana Noginova devised mermaid costumes that are fantastic in every sense of the word, with tails attached to the mermaids like spring-loaded bustles that wave, float, and bounce on their own, and she puts the human women in hilarious puffball gowns. I couldn’t wait to see what the characters would be wearing next. Genius set designer George Tsypin, making his Broadway debut, creates a series of beautiful, surreal tableaux with the odd sculptural use of clear Plexiglas, drenched by Natasha Katz in dazzling saturated light. “Under the Sea” becomes a delirious carnival celebration, and the set for “Kiss the Girl” is some kind of gigantic Lalique spinning lamppost that you might ride in Disneyland on acid. The designers all go to town with the character of Ursula. Sherie Rene Scott, who’s poised to join Bernadette Peters and Patti Lupone in the ranks of Broadway’s beloved gay divas, plays her as Cruella DeVil by way of Carol Channing (with more than a dash of Bette Midler). Her hair is a Medusa mass of frosted snakey spirals. Her outrageous costume consists of octopus tentacles that practically span the entire stage. And her accessories include two electric eels with glitter lipstick named Flotsam (Tyler Mainard, who was the sensationally queeny star of Altar Boyz) and Jetsam (Derrick Baskin). Her every appearance brings a tiny but welcome shot of campy spice to what is otherwise a pretty bland bouillabaisse.